An Automated Role Based Access Control .NET framework with T-SQL Query Parser which automatically parse select, insert, update, delete queries (row and column level security) based on the logged in user role. It also maintains user interface entitlements like menu, submenu, screen and screen elements. Security layer generally just performs authentication & authorization, and to facilitate roles (permissions & entitlements), developers implement various HasPermission(), IsInGroup(), etc. type methods with many ifs elses &amp; switches, various sql queries and inject code into these layers(2, 3 & 4). Basically to enure that users with appropriate rights are performing appropriate operations. Users should see what they should see on the screens, users able to do what they are allowed to do with data. During initial few releases, everything looks good, but messed up soon when complex business scenarios, exceptions are introduced, more ifs, switches are introduced in those layers, code quality decreases and code volume increases and makes production support & enhancements difficult. Nightmare for new team members! 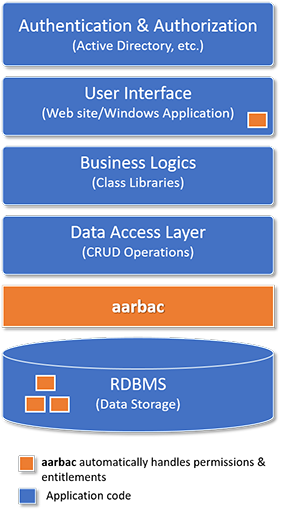 aarbac is An Automated Role Based Access Control .NET framework which can override all CRUD(Create, Read Update, Delete) operations automatically based on the logged in user role. It separates out permission related code into a complete new layer and let these layers (2, 3 & 4) do their regular job & not worried about the permission at all. Additionally it also maintains user entitlements. 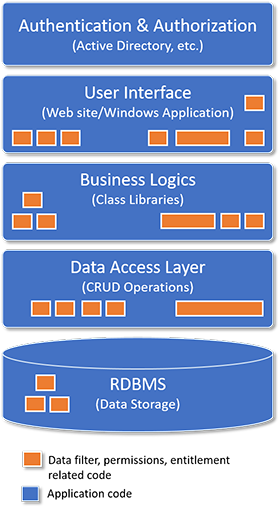 Automated - Data Filter & Permissions are abstracted into a separate layer and all automated. Schema based - Data filters and permissions are based on your database schema. Clean Code - Clean code, less error, less testing, less maintenance. Encrypted - The role, entitlements & user parameters are encrypted and stored as binary in the aarbac database. Disable overriding for specific queries - As we do understand there will be few queries where aarbac may not able to produce automated result as desired, in those cases, just switch off aarbac. Comes with REST API, Utility, WinApp testbed, Sample Code. ...assuming user belongs to a role which allows him to see only 3 columns from author table and only allowed to see authors from New York and Charlotte cities. And just set visible and enabled properties on those nodes. When user logs in, i.e. authenticated and authorized based on your authentication mechanism(for example active directory of the organization), just map user with a specific aarbac role, & each role will have entitlement. App developers need to apply the entitlement xml into the menu and screen elements. Copyright 2017 (c) Debjyoti Das. All rights reserved.